i wish this option was available. that i had requested to return to when we started . I did this every year with ATT. I used to dread the yearly phone call. It is a monopoly/oligopoly squeezing every possible dollar from us. Hopefully it is a business model that is on its way out. Google Fiber charges the same amount every month and you never have to call them. cut cable off three years ago this April.. so that bit taken care of. But I do realize I can’t do that with every bit of consumerist inanity thrown my way: just need to wade through these kafkaesque waters with wit and grit I guess. Well-handled. I absolutely hate dealing with these things. Oh, my gosh. I had that conversation not long ago. Try explaining to Comcast that you shouldn’t have to pay for their grand package when you don’t even own a television. Incomprehension doesn’t begin to capture the response. Good for you for making it through! I hope this is a price that sticks, untied to some hazy amount of months or years, Beth. Enjoy watching the channels you want! I once tried to call Comcast on my cell phone, but was told that they had to send my secure log information via my Comcast phone…which I don’t have….which they told me I am paying for….I’m on blood pressure meds now. At least they did finally work with you on it. Ours goes up twice a year between 10 and 20% each time. We’ve gone in person and spent hours on hold, and they always say that it’s not their rate going up, it’s the taxes. 40 extra dollars in taxes. Twice a year. But I have to have HGTV and Food Network and Hallmark Channel or I would die LOL. At least you don’t have to deal with it for another year! Not the annoyance with cable…I meant your reflections! I feel your pain. Been there (on hold); done that. But remember, there is a nice glass of wine at the end of that rainbow. But not during the ordeal. They depend on early drinking to make you acquiesce! Good summary of a familiar, common experience. We’ve grown accustomed to an uneven communications playing field. I imagine your cable company also is a monopoly. I just cut the cord and got rid of the expense. I had the same thing happen. Only we never got back to the promotional price. You just resurrected some old nightmares. I have saved time and frustration by going to my provider’s store. Looks like I am going to have to apply the same approach. I just received the same phone call and I probably was not as kind on the phone as you were. The guy from Comcast called while I was at work and trying to get a quick quote to a customer. He wanted to do everything over the phone and would not send anything to me in writing. He got frustrated with me and terminated the call. Oh the turmoil of our television needs. I remember the first time I paid for cable. $27 dollars a month! I was mortified. Horrified. Dumbstruck. How I would love to go back to that. Some entrepreneur should start a ‘negotiate-with-cable-companies’ business on behalf of us consumers. I would gladly pay someone to represent me to go through this farce which you so well described. Even if I have to pay a fee equal to, or moderately more, than the amount of savings negotiated, it would be worth the time and hassle avoided! That negotiation is called, “cancel” and mean it! a sound investment in music tunes out tv tribulations. i do enjoy the way you handle these situations. Ugh! These systems are so ridiculous. Every time my dad’s bill goes off, he just tells them to shut down his entire service. He honestly doesn’t care. Then they always give him a great deal after that. We just went through this. We made the move to streaming. We purchased Philo at $17 a month. When I. Allied back to cancel my cable, I was sent to retention who magically came up with new packages for me. Alas, I explained it was too late. The time for retention was the day I called to complain about the increase. I am thrilled with the time added back to my life by not watching so much mindless tv. You are preaching to the seriously over-exasperated with customer service choir here. The fact that we are tone deaf and singing off key does not mean we don’t appreciate your chorus! Who hasn’t been driven to near insanity by any of the cable companies! We switched to Hulu when we moved to here in VA. It cut our cable bill in half. This is not a promo for hulu, just an example of what alternatives we may have if we’re ever aware of them. There are other alternatives, too. But, I still miss the “good old days” of 4-6 channels of shows that were actually entertaining. That is is, you just have to be firm with them….. they want to keep you and do anything to please you. Well done. I am sure you are gutted not to have the “paint dry live channel”. I wanted to get rid of Sky which was in my ex husbands name and they just did not let me leave, so I asked my son to to phone, they do have the same name, and even he had problems. Only after he said he will be omitting suicide tomorrow they ended the contract and gave him the number of the Samaritans. He is living happily ever after, and he did me a great favour. I don’t actually watch TV only very occasionally at Christmas, people just cannot believe that I rather read or make crafts. I finally got so frustrated with this annual song and dance that I pulled the plug! It is so freeing. I got a Firestick, Netflix and now Hulu is free through my Spotify subscription. The one show I decided I could live without I purchase through Amazon. Now I watch very little TV and listen to more podcast and music. After the initial shock, I do not miss TV. It is amazing how calling up a TV provider can make you nearly (or actually) lose your mind. We finally just canceled our service entirely for the very reasons you mentioned and then some. We cut the cable almost two years ago when they refused to lower the price of the “bundle”. Like you, we didn’t watch more than a few channels and the ones we really wanted required subscribing to a bigger, more expensive package. We signed up with streaming service Sling and are happy. No gimmicks there! We still have the internet service through the cable company and have kept the landline, because without it, the internet-only bill would be even more. I would never go back to cable tv! 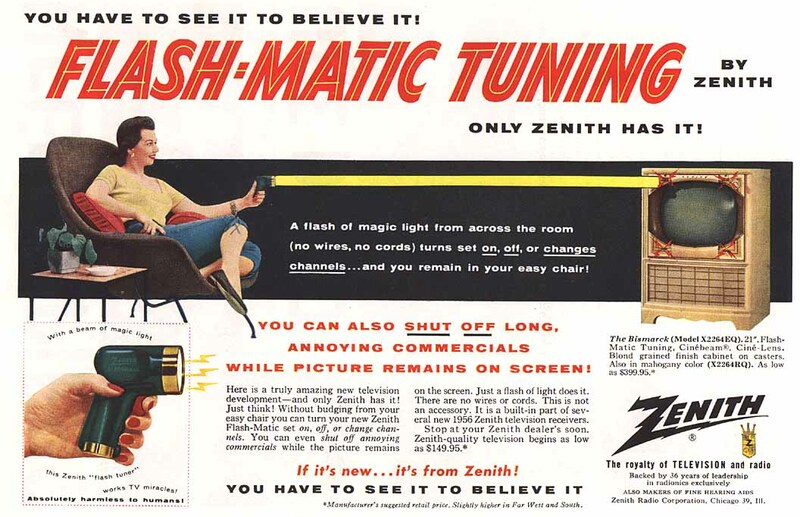 A humorous post, and I loved the retro ad … too bad the “absolutely harmless to humans” Flashmatic Tuner couldn’t have been used to lessen your time spent listening to the hold music. At least the CS rep came back with the right cable math formula. That’s the best! So glad it worked out for you. Apropos quote, too. I always need 3 cups of coffee and zanax when forced to call and deal with them. And I end up inventing a ton of new words that would make a trucker blush. This is so true. One tries to live simply, but there is always some company that raises the rate.